‘Tis the season to REMEMBER. Last night we had all sorts of ‘fun’ with death, with the help of this beautiful ofrenda. This gift from Mexico is with us all week! And will be the focus of our worship next Sunday morning – so please bring a photo or special memento of someone important to you who has died to place onto the ofrenda in celebration and remembrance of them. We are also hosting St Michael’s and St Chad’s to mark our ‘church birthday’ (or patronal festival) of All Hallows’ so do please bring some food to share with them over lunch if you are able. Maundy Thursday was an amazing evening of Jewishness, Jesus and Junk Food! Our Jewish friend David Winston (with Heston as his sidekick) led us through a Passover meal; the ancient liturgy and symbols helped us to understand more deeply the ‘past’ of our Christian faith, and also the ‘present’ message of freedom and hope it offers in our modern world. This was especially poignant with our night shelter guests (fleeing homes in danger, longing for freedom and fullness of life) sharing the meal with us. Then we had a wonderful (partly-kosher!) dinner courtesy of our Junk Food Café; our imam friend Adam taught us about wudhu (ritual washing before Muslim worship); and then David R-H led us reading John 13, saying our prayers and washing each other’s feet. St Francis of Assisi recognised that lots of people are keen to love and serve God in daily life – but not keen to live in a friary or convent! So he formed the Franciscan Third Order to complement the First Order (Friars Minor) and Second Order (Poor Clares). This enabled anyone to follow Jesus in the Franciscan way, and commit their daily lives to intentional love, joy and humility. We have had a lot of positive comments about this cross made by Kerry at the IDAHOBiT 2015 event a few weeks ago, so here it is for everyone to see. Hope you can read it! Click on the cross for a larger version. A new group, led by our very own Pippa Woodhams, will be beginning to explore our relationship with the natural world, in creative, experiential ways. These explorations are being called “Wild City Retreats”. 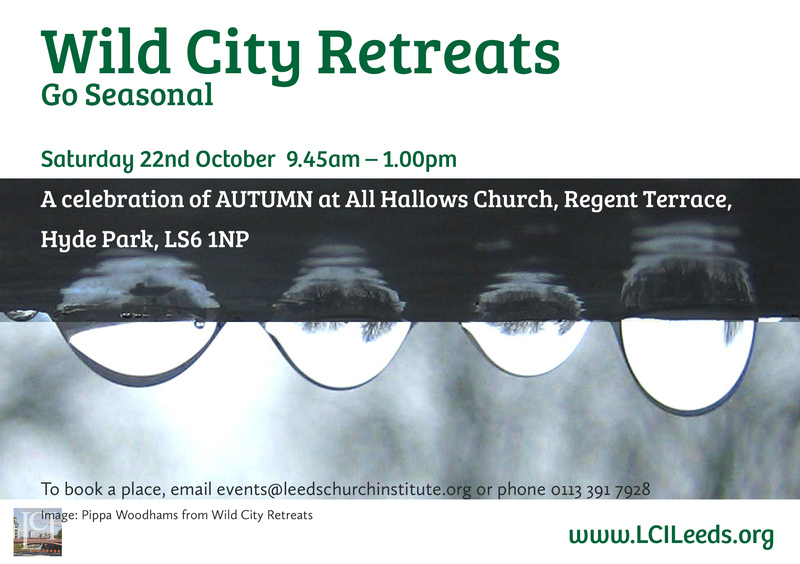 If you are interested in learning more then visit the Leeds Church Institute website or talk to Pippa. The first “retreat” will be on Saturday 11th October. I’ve been thinking about war. And those go to war for whatever reason: duty fear vengeance love rage patriotism compassion; and whether they are fighting for self, family, friends, country, religion, politics, or whatever. We often speak of Jesus preparedness and even his willingness to die to die for the whole world, but how do we respond to men and women today who are prepared to die for others? Pity? Awe? Rage? Apathy? And we who hate war – what do we feel about those in the forces who go off to fight on our behalf – or at least at the behest of our elected leaders? And what do we feel for those innocent parties – referred to as ‘collateral’ when they are killed accidentally by a bomb or a shell or when a child is blown to pieces by a cluster bomb they’ve picked up thinking it’s a plaything. And how do we respond emotionally to those who say that sometimes war is the last, least wanted and universally abhorred but only option in certain circumstances? How do we reconcile the evils of war with sometimes needing to combat and destroy monstrous evil in the world? Is war ALWAYS wrong/evil? Yes, I hear myself reply. But it also seems to me that when we speak of war we are speaking of where war is conceived – in the human heart; and so is the human heart always wrong/evil? This time I hear my reply is NO! The human heart may be weak and prone to sin but human life even in all its frailty may never be wholly right but is not always wrong and evil… it may be where wrong emanates from but it’s also where love and compassion reside…. In the past I have spoken on occasions such as this and talked about selfless acts of compassion and bravery – like the crew of the little fishing boat deliberately sailing their boat beneath the blazing Piper Alpha gas platform in the North Sea , putting their own lives at risk to rescue a man clinging to one of the support pillars. Or the story of bravest soldier of the first world war, as he came to be known: In the first world war, soldiers were digging a tunnel to undermine the German trenches. It caved in and trapped them but rescuers dug a narrow tunnel to them everyone crawled out except one lad who was too badly injured to crawl. It was then that one of his comrades, a 43 year-old ex-miner called William Hackett refused to leave and stayed with him while the others all escaped so he wouldn’t die alone in the cold and dark. Before the others could dig their way through again, the tunnel collapsed completely and both died and are entombed there together to this day. William Hackett was awarded a posthumous Victoria Cross. But today I want to look at us and how we remember acts of selfless courage but link that selflessness to our own behaviour. But what about those times when we find ourselves in conflict, not with an enemy on a battlefield, but when we find ourselves at odds with someone else? In most conflicts, it seems to me, there are those who want to control, punish, even eliminate others, whether in war or a playground argument, and if we are serious when we talk about creating a better world, the thing we need to give up and surrender is often more to do with our need to be right, our desire to win at all costs – in other words, our pride. Sometimes it’s brave soldiers like William Hackett that show us the way; sometimes it’s children: In Marcus Zusak’s ‘The Book Thief’, set in the Nazi era, a young Jewish German girl is sent to southern Germany for supposed safety. During a Hitler Youth rally there is a stampede and she hears her name being called. She looks around and on the ground she sees the boy from her school who has been taunting and humiliating her since she arrived in the town. His ankle is smashed and bleeding from the stampede. She might have laughed at his misfortune but she sees, not a spiteful boy but ‘a wounded animal’ needing care and protection and she immediately goes to him and helps him. Compassion overcomes fear and retribution. The fishermen, the soldier, – if they had failed to act on their compassion, if they had ‘tried to save their life’ what kind of life would they have been in effect choosing, I wonder? In countries around the world people are dying for their faith (or at the hands of those who think they are killing in the name of God ) – whether Christian, Muslim, Buddhist, Jewish or whatever. I pray that none of you ever have to make that supreme sacrifice in the same way.